Over a splendid autumn weekend, more than 117,000 people turned out for the Melbourne Food and Wine Festival, which comes to an end today. Sunday was dedicated to the theme ‘Celebrate the Beans’, and coffee and chocolate were showcased along the path between the Yarra River and Federation Square. The irresistible aroma of these two products lured crowds to the stalls, where they could taste coffee varieties and learn about the production, roasting and preparation of the famous bean which has more or less conquered even the most traditional Melburnians. There were many stands representing companies that specialise in the production and distribution of coffee machines for domestic use. Between cups of golden liquid, guests enjoyed music and songs in a program heavily influenced by Italian culture. Led by Betty France, the choir Voci di Donna performed a lively repertoire of modern songs with verve. Other musical ensembles present include groups from Brazil, Turkey and Africa. The battle for the title of Australian Barista culminated in the crowning of Hazel De Los Reyen of NSW. Federation Square’s BMW Edge hosted many cooking demonstrations, some held by renowned restaurateur and television personality, Stefano de Pieri, of Mildura. On Saturday, de Pieri cooked with Tobie Puttock, demonstrating how Italian cuisine, particularly from the region of Veneto, is spreading across the world. The two chefs prepared typical dishes such as pasta e fagioli, while sharing anecdotes and information about each recipe and its ingredients. On Sunday, de Pieri cooked alongside Patrizia Simone, a resident of Bright who originally hails from Umbria. 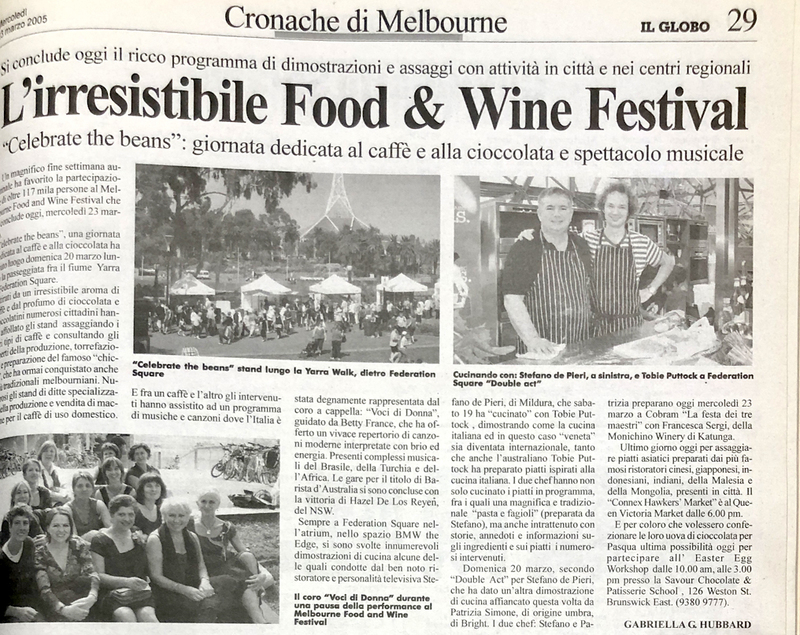 The two chefs will also work together today in Cobram, cooking with Francesca Sergi of Monichino Winery, in Katung, for an event entitled ‘La Festa dei Tre Maestri’ (Feast of the Three Masters). Today is the last chance to try Asian dishes prepared by the city’s most famous Chinese, Japanese, Indonesian, Indian Malaysian and Mongolian chefs. If you’re interested, head to the Connex Hawkers’ Market, which will kick off at 6:00 pm at the Queen Victoria Market. For those who would prefer to make their own Easter eggs this year, an Easter Egg Workshop will take place from 10:00 am to 3:00 pm at the Savour Chocolate and Patisserie School, at 126 Weston Street, Brunswick East (9380 9777). This story appeared in the Wednesday March 23, 2005 edition of Il Globo.